Brothers Hector and Pablo Durigutti are the winemakers behind the Las Compuertas Project. Their backgrounds are quite complementary: Hector started at Alto Las Hormigas at the age of 15 and has completed 25 projects at various well known wineries, learning old world techniques and agriculture. Pablo started at La Rural, a winery now owned by Catena, and honed new world viticultural practices. The two brothers are amongst the most well known young winemakers in Argentina right now. The Compuertas Project began in 2007, when Pablo and Hector purchased 5 Ha of old vine Malbec vineyards in Las Compuertas, Mendoza, steps from their winery. The estate now goes by the name of ‘Finca Victoria’, after Hector and Pablo’s mother. With Las Compuertas Project, Pablo and Hector aim to support the local growers who proudly maintain the vineyards and traditional practices of this historic winemaking region in the face of aggressive urbanization. At 3,500 feet altitude, Las Compuertas has some of the coldest weather in the region and features significant soil diversity. At the outset of The Compuertas Project, Pablo and Hector had a precise analysis done of their vineyards, identifying 5 distinct soil types. They have carefully adjusted their care of the vines accordingly, coaxing the best grapes out of the 75-104 year old vines. Two of the three wines from Las Compuertas (the Malbec 5 Suelos and Malbec 1914) are made with grapes from centennial vines, planted in 1914, while the vines for the third (Criolla Parral) date back to 1943. Hector and Pablo farm their historic vineyards organically with a clover cover crop and the grapes are hand harvested into small containers. The whole grape fermentation is spontaneous with native yeasts and takes place in concrete eggs for the ‘Malbec 5 Suelos’ and ‘Criolla Parral’ wines and 2,000L foudres for the ‘Malbec 1914’. Pablo and Hector call Las Compuertas home, living and raising their families here. The Compuertas Project is their way of giving back to the region. As Pablo explains, “We set out to become a part of Las Compuertas…We feel a strong commitment to reclaiming the traditions of this historic wine-making area and becoming the interpreters of this unique terroir.” The resulting wines are entirely unique and elegant representatives of the best this storied region has to offer. Criolla Parral: 100% Criolla Chica (Mission). Vines planted in 1943. Fruity with notes of strawberries, quince, cherries and fresh plums, as well as freshly pressed grapes. The mouth-feel is dry and refreshing. It flows leaving a tasty and balanced sensation in the mouth. Medium-bodied, with pleasant tannins and a long lasting finish. RS 2.06 g/l. 265 cases produced. Cordisco: 100% Montepulciano, massal selection from very old vines. Soft cherry red color, with subtle hints of pink. Aromatic nose of fresh blueberry, cherry, blackberry and plum with layered notes of cassis liqueur, oregano and sage. Balanced and refreshing on the palate with soft, well integrated tannins and an extended finish. 247 cases produced. Malbec “Cinco Suelos”: 100% Malbec from the Finca Victoria, vine planted in 1914. 5 parcels representing 5 distinct soil types are each vinified individually before assemblage. Vivid red color with violet hints. Inviting aromas of blackberries, blueberries, plums and violets, with layers of cassis, herbs and earthy notes. Fresh and wide on the palate with a firm mid-mouth, fine grained, rounded tannins and good balance with a long finish. 760 cases produced. Malbec “1914”: Also from the Finca Victoria . Aged in 2nd use oak foudres. A bright, purplish red color. 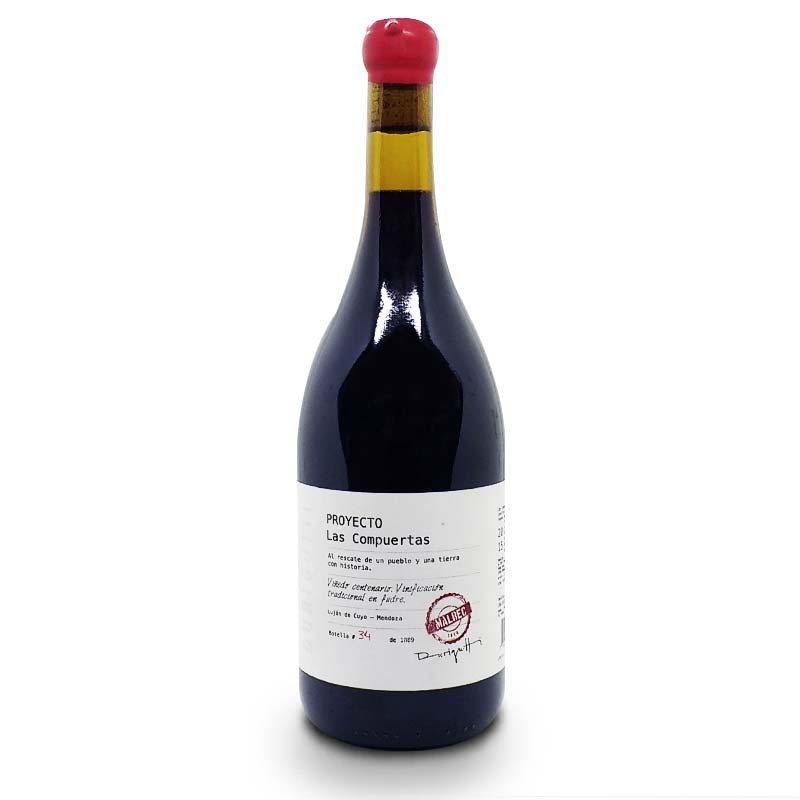 Fragrant aromas of fresh black plums, cherries, blackberries, violets and wild herbs, with layered, deeper notes of chocolate and cloves. Full bodied and expressive in the mouth. Good structure and balance with fine-grained tannins and a long finish. 157 cases made.